How is your Aikido in everyday life? In fact, do you avail yourself of your Aikido skills in your daily life at all? Do you ever find yourself in pointless conflict? Stuck in an argument? Luke's second book 'Verbal Aikido Orange Belt' is now out ! Why do you practise Aikido, is it so that you can confront an enemy and win? The one element you never train for on the mat, and I would submit is more likely to save your life than not, is to prevent the attack in the first place. Talk them out of it. Why fight with those who you can befriend instead? Yup, that's one bit of training in Aikido that you will rarely find on the mat and yet in real life a verbal attack is most likely to occur first - possibly followed by a physical one. Look at Luke Archer's web site and consider his book. Could be a life saver . . . I can guarantee it will be a life changer. Are weapons a part of your training experience? an article by Andrea Harkins. Andrea's ideas and writing are always worthy of your time. Martial arts woman . . . for women's eyes only ! Martial arts saved me from being grumpy, disappointed, lonely, inconsiderate, and unhappy. They saved me from being complacent, mean, stubborn, and bitter. Because of martial arts, I’ve been able to push the negative from my life and replace it with hope, insight, and positivity. I can look in the mirror and be content with who I see; not just the physical person, but the one who has overcome, grown, and achieved personal success wholly due to martial arts. Looking back 26 years, I would never have become the person I am today if it had not been for my journey into martial arts. Back then I was not as confident, tenacious, or positive. If I continued being that way, I would be struggling with so many life and health issues today. I would lack motivation. I would be negative and constantly complaining. I would be unappreciative and sour. How do I know this? Because, when I look around at some others who are my age, that is what I see. I’m not being judgmental because everyone has a right to live their life exactly as they choose. I, however, want not of that. I don’t want to “choose” anything; I just want to “do” whatever I can to make each moment count. Because of martial arts, I am not lonely. I have martial art friendships that are deep within my heart. These are people I trust and admire and role models I aspire to be. When you surround yourself with others who are exceptional, chances are that you will find the “extraordinary” you. It is because you rise to the challenge. The opposite can happen, too. Surround yourself with negativity and you will find yourself wallowing in it. I’m going to do whatever I can to cultivate passionate and reliable relationships that carry me through my difficulties and continue to apply a powerful martial art mindset to life. You can do this, too. Just make the choice to work diligently toward the positive and push the negative aside. Everything in our modern culture points us in the wrong direction. There are very few cultural concepts that direct us to be warriors and leaders. A martial art can provide you with the quest for ambition and excellence, and that is what it did for me. The day before I attended my first martial art class, I lacked leadership and belief in myself. Today, I use whatever I know to help others succeed and find happiness. Yes, where would I be today? Martial arts were my saving grace. They helped me walk toward becoming the best that I can be and to strive higher than I ever imagined. Truly, martial arts saved me in more ways than I can ever describe. Courtesy of Aikidojo Zaragoza Traditional Takemusu Aikido School of Arturo Navarro. An interview with Sensei Lewis Bernaldo de Quiros. This is a short extract from the interview and is included here because of the subject matter - 'why use weapons?' The translation from the original Spanish leaves a bit to be desired but with some thought you will understand this meaningful discourse about use of weapons in Aikido training. Aikidojo Zaragoza: Let's talk about teaching. In Iwama special importance is given to the practice of weapons, Especially with Jo and Ken. ¿Why is it so important? careful in practice with weapons. Maybe we can get away with forcing a taijutsu nikkyo or be imprecise in its application but with uchi yokomen with bokken we can not lose control for a moment - or get injured another. This quality control is highly accurate and transmitted our practice taijutsu. Another important aspect related to the above is the intensity. With kumijo kumitachi and have the appropriate level when we can practice with a speed and intensity that is difficult to achieve in taijutsu. With taijutsu this is much more difficult and much depends on the ability of our uke's. Yet I can not practice shiho nage for example at the maximum speed that I can. It's too dangerous. The point here is not only the speed itself, but to experience high energy and power conniveles contain. Another important point that teaches us humility weapons is practiced - and respect our opponents! Perhaps the greatest man who feels no danger training with other smaller or less strong in weapons taijutsu can feel very disadvantaged when the other is now faster and more intense in their attack with a weapon. As budoka it is not just a matter of courtesy must never devalue or judge others. This is creating a suki (opening). A short personal story about this question. Sensei always commented that bukiwaza and taijutsu are related and that the essential work of the body, and tai sabaki is awase weapons. He understood but did not feel it. The third year in Iwama I injured my left knee and could only practice weapons morning. At night he is attending class but only watched. After eleven months (and surgery) I had recovered enough to sit up again taijutsu and clearly remember the trepidation with entering the dojo that first night: I was afraid to have forgotten everything! But with tai no henko and morote dori kokyu ho immediately felt my Aikido had taken a leap forward! And in that moment I understood physically what Sensei told us about Riai. I clearly felt the bokken in my taijutsu techniques first. "We will have one world or we will have no world. We will all live together or we will all die together"
People begin their aikido careers for various reasons – some may want to keep fit, some may have been inspired by watching a film, others may have been dragged along to the class by a friend. Often, learning self defence is a factor involved in this decision. To start with, one may view self defence as a sort of computer programme, where it works on the basis of 'if your attacker does this, then you do this'. This of course is fine to start with, while you are starting to accumulate a repertoire of techniques and discover what works for you and what doesn't. You will eventually develop a range of options for each eventuality. In reality though this approach has its problems, a situation in which self defence is required will be completely unpredictable, and it is unknown exactly what the attacker will do. Even if you can predict the attacks, they will not be applied in a predictable way. Therefore, while the rehearsed techniques must become an intrinsic part of the available repertoire, it could be a mistake to think that each one is a programmed response to a particular attack, and that it will work in exactly the way we expect. Therefore we might think about practicing aikido in a way which accepts the unpredictable nature of reality. Self defence training may be developed so that, having learned techniques, they are applied in ever changing ways and situations, for example when it is dark, when it is cold, when the ground is slippery, when the attacker is drunk, when you are in a confined space, when you are injured, etc. All of these variations help to develop self defence application, but please be careful in training, because as you develop realism, things can get more dangerous. Even after all this, an approach to self defence where the intention is to repel an attack, is still only one element of self defence. When practical self defence is needed, it could be considered that more suitable strategies of self defence have already failed. A preferable strategy would be to develop the ability to escape from a situation before the need for physical combat arises. This will require that a greater sense of awareness is developed. It would be even better to avoid being in that situation in the first place. This is reminiscent of the 'recruitment' scene in the film 'Seven Samurai', where the prospective recruits must enter a room. The first is struck on the head by an attacker waiting behind the door. The second successfully repels this attack, which is better. However the third doesn't even go into the room – he anticipates the attack and so avoids the need for physical combat. Bruce Lee named his martial arts style 'jeet kune do' ('the way of the intercepting fist') in recognition of the importance of this ability to anticipate. Progressing from responding to an attack, he then advocated responding to the attack before it had actually been initiated, by detecting the attacker's intent (possibly by noticing a barely perceptible movement). Ultimately it might be possible to respond to an attack even before the attacker had thought of making the attack! It would of course be very hard to argue this as a self defence case in a court of law: 'I defended myself even before the attacker knew that he was going to attack me'. It does though provide the opportunity to escape from a situation, or to avoid it. In aikido training, as well as learning techniques, movements and discipline, one is also learning awareness, and attention to this is important. We might consider awareness as the first line of self defence in more ways than one. It might prevent us from being involved in an accident by allowing us to anticipate the careless actions of another person, or it might prevent us from experiencing an injury at work due to anticipation of hazards. Increased awareness of health status is of vital importance. Those people who recognise signs and symptoms of a serious disease early stand a much better chance of survival and recovery. So how does it work? Viewed as a purely physical manifestation, awareness is a function of the nervous system. The nervous system is made up of the central nervous system (brain plus spinal cord), and the peripheral nervous system (all the other nerves). We are consciously aware of the operation of some nerves, for example when you feel pain, or move your muscles. These are generally known as somatic nerves. Other nerves – the autonomic nerves - operate subconsciously, for example you do not need to consciously calculate how much oxygen you need to inhale, or how much sugar you have in your bloodstream. Your nervous system works this all out without you knowing and makes sure that your physiology functions properly. In the same way that we trust our autonomic nervous system to take care of all our internal physiological processes, we might also learn to trust it to initiate the correct responses to situations, and so rely on autonomic responses as well as somatic responses. This would mean that, as long as we have developed the natural ability to execute good aikido technique, we don't need to rely purely on conscious memory, and its list of 'if this…then this' responses. This frees us to respond much more naturally and in harmony with events. This is not to discard the idea of conscious responses. Cultivation of the conscious calculative parts of the brain is important and this is developed through acts of memorisation, calculation and logic. However it can't do all the work on its own. For heightened awareness it must be used in combination with other less tangible areas of the central nervous system, such as the hypothalamus, the pituitary gland and the limbic system, which govern our interaction with the environment and our subconscious. As martial artists we are constantly working towards developing abilities which seem to defy normality. In relation to awareness, we might consider those curious areas which lie slightly beyond physical sensation and perception. When strange things happen, can we simply explain them by referring to the physical and chemical mechanics of the nervous system…or is there something else happening which we, in the martial arts, might have access to? It is yours to discover. The Shocking Truth About Martial Arts. Martial Arts are generally considered to be fighting skills derived from the Eastern hemisphere, Japan, China and Korea, etc, Violent images as seen on TV or in films may lead one to believe that they are all about violence, but this would be far from the shocking truth. Self defence is one aspect; nobody wants to be a victim of violent crime, but beneath the surface lays many secrets as yet untold in the West. Of course, it must be remembered that even in films Martial Arts is used defensively, rather than offensively and often in a fight for life. What would you do if you were being attacked by one of today's drugged-up thieves or relentless robbers? They don’t care if you are a pacifist, have faith in something or do not like violence, they are angry and imbalanced, so will attack even the meek and innocent. Traditionally many people learned to protect themselves and their families. This is not “gratuitous violence” but common sense protection. Does the Martial Arts practice promote violence though? Traditionally, a word which has a wide context, the instruction is not to encourage people to beat others up, but only to react to a violent attack in self-defence. Real Martial Arts or Fraud? “How can we tell if our local teachers are giving us something safe?” Good question. Pre-judgement is something none of us want and it can cause problems. Knowledgeable judgement however can solve or prevent problems. Things to look out for include frauds that have more qualifications than they could possibly have achieved in a few years. These may include “world champion” titles when they have never been outside of their region, promises of “black belts” when you sign up for 3 years, or “faster track success” for even more money. Another one is the classic “call me Master” syndrome, no real Martial Arts instructor would dream of it! Lately there has been a trend for MMA or “Mixed Martial arts” schools to pop up here and there. Are they real or are they frauds? Just check out their qualifications, if they have got real Instructor certificates in more than one style, that are traceable, then they may be genuine, otherwise be wary. Young “Masters” pop up here and there but there can be no such thing. It takes many, many years to reach a level of mastery, not just the hollow claim that you have “invented” a new system or improved what you thought was an inefficient one. This is just a thin excuse for someone who could not be bothered to train for a long period but wants to be called “Master”. Many traditional Martial Arts have been around for a long time. Ask the students what they get out of it and if they often get used for target practice or sustain injuries during practice; the odd one is inevitable, but no more than the odd one. Many western fitness fans don’t see that some of the modern fitness gurus are actually trying to take bits-and-pieces from ancient tried and tested methods; e.g. Yoga, Karate, Tai Chi, Ch’i Kung and so on. It really isn’t necessary as the “old school” styles have it all, or should have after a hundred to a thousand years of development! What about Mental Health? As someone who has studied psychology, sociology, health, fitness and self-defence for over fifty years I can say with all honesty that Traditional Martial Arts, generally, offers a path not only to better physical health but better mental health. Take PTSD, for example. Many people around the world who teach traditional Chinese T’ai Chi Ch’uan/Taijiquan or “Tai Chi” (misnomer) are now teaching sufferers of PTSD (Post Traumatic Stress Disorder) because it has such a profound effect. This movement was recently pushed forward by a UK organisation, MAFCUK. Logical thinking in a “one step at a time” manner can help the human brain to grasp back some of the damage done by shock and fear. It can help someone get back on track. A marvellous “tool” indeed. As for the average person in the street, it can help them to focus, take control of their direction, stay calmer, avoid common illnesses, think more clearly and generally stay younger for longer. This is why it is part of every day “society fabric” in the East. Written by Professor Mike Symonds, MA. Martial arts and dangerous occupations - a comparison of principles. 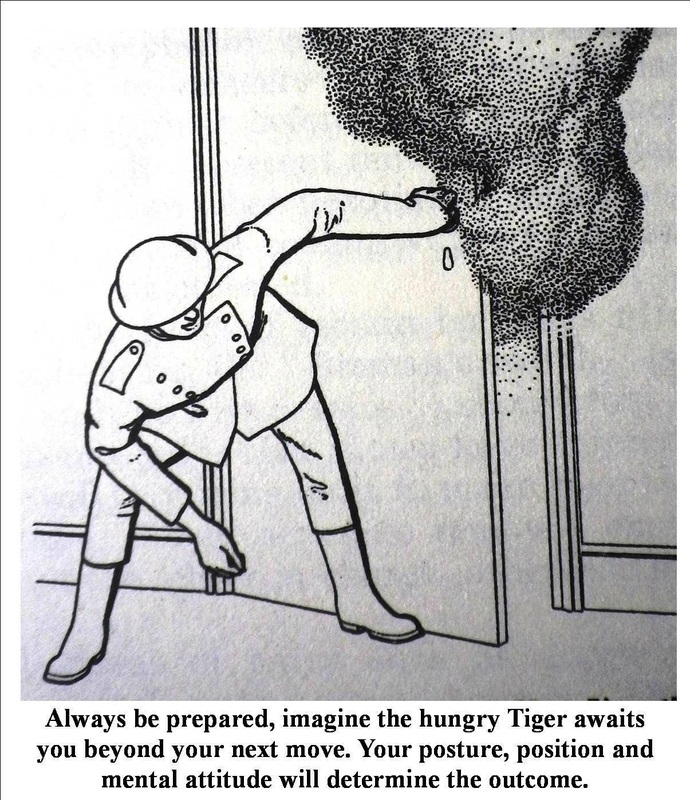 Photo courtesy of Manual of Practical Firemanship, first published 1945. Consider this simple list of principles. Maintaining a safe and guarded posture. Develop sensitivity to any advancing danger. Remain calm and focussed throughout. Be adaptable and react intelligently to change. Promote the will to serve others. Practice realistically and for any situation. Train your spirit as well as your body. The quality of your actions and deeds become more important than the façade of ego. At the core you find an empathy with others, a shared sense of brother/sisterhood. You aspire to being better, in your actions as well as within self. A good reputation must be earned. Your intuition improves and a sixth sense develops about possible dangers. You cultivate a deeper and ultimately beneficial appreciation of responsibility for your own actions. Consequences become a reality in your life. Techniques and consequences may vary but the principles, the real essence of each activity are the same. Facing risks to your health in any form raises your awareness to the value of life itself. Visit a local club and find out just how much you might be able to joyfully bring to the art. It’s not that dangerous . . . no more so than what you might do every day! Begin a new and interesting path in life by joining a local club, why not start with an Aikido weapons class in Bideford. The class is open to adults of all abilities and experience. The range of ways and circumstances in which people have used what they have learnt on the mat to deal with whatever life throws at them is simply amazing. 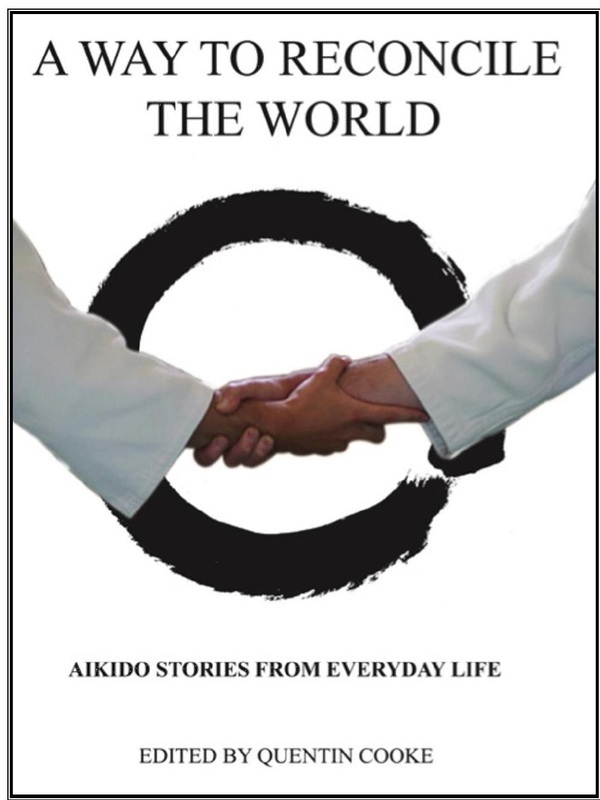 Some stories are very short, some much longer, some make a simple point, and others are far more profound, but they all serve to inspire and motivate any serious aikido student and maybe will serve to entice students on the mat when they understand the benefits of aikido practice. On the most basic level, the book is simply a good read and enjoy. It is the ideal book for aikido teachers to promote to their students, because it simple focuses on what can happen if they keep on training. Aikido seeks to promote harmony, but all too often in the aikido world, the different lineages seem to focus on what divides us. However, in putting together the book from so many diverse places, it became increasingly obvious that we are mostly climbing the same mountain, albeit the chosen route may be different. $25 – AE members get $5 off! My teacher, Sensei Tony Sargeant 6th Dan Aikikai has just published this book about his forty years of Aikido study. The book contains technical advice of value to any Aikido student or teacher as well as insightful information on the search for that which O-Sensei sought in his own lifetime. Conversation on Jo at lunch break, 6th November seminar in Poole. Present, myself, Andy, Nigel and Julian.."Why make a move that is unnecessary, keep it simple. ... don't give away your intention". Etiquette will mean that you select a good Jo .... and not someone elses'! A quality Jo is less likely to break when you are depending upon it ... eg in Jo dori or Jo nage. ....and look after it. Also don't lean on it when on the tatami as it damages the mat for one .... or any where else come to think of it." "Keep the shoulders relaxed and as far as possible your elbows in more than they are out, remain free flowing in action." (Leaning on your Jo means that you have given away your control of gravity to something other than self). "Keeping two hands in contact with the Jo when active has an advantage, also when changing hands, crossover of hands, don't take the hand too far from the Jo." Without tension is surely the way of peace. Great idea to keep your folded Hakama clean and safe, see below. 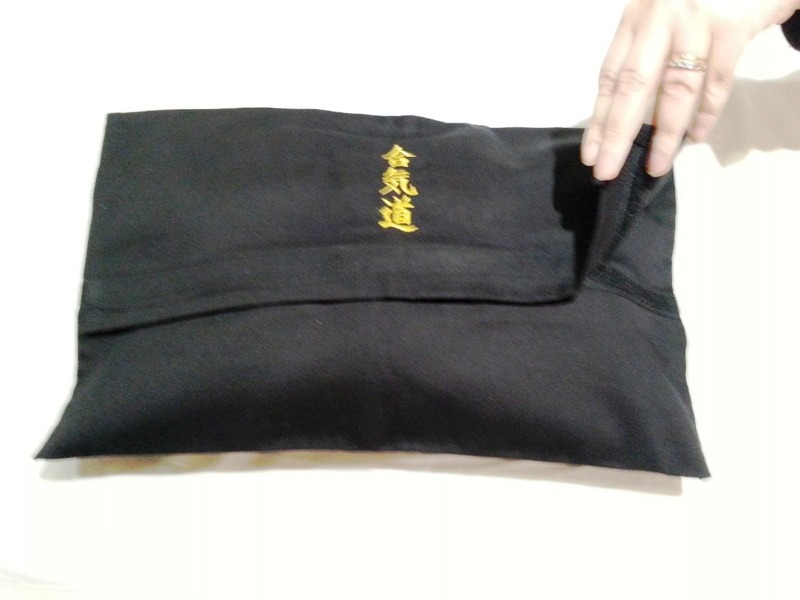 "I don’t know if it’s of interest, but I have just designed some hakama bags which specifically protect your hakama from dirt in between practices. They will keep your hakama neatly folded and to allow it to breath and wick out any moisture accumulated from that full on practice. " Your own logo is possible through negotiation as a set up price must be paid to manufacturers. All prices are inclusive of postage and assume purchase in the UK. If from outside the UK, the price will increase a little to cover the extra postage. I am however giving a 10% discount to members of Aiki Extensions. All profits go to Aiki Extensions Charity. A conversation about Jo – Easter 2011 Kefalonia in the Ionian Sea. Present; Sensei Tony Sargeant 6th dan Aikiki from the U.K. ; Sergei Stoliarov 3rd dan Aikiki from the Russian Federation; Sensei Richard Small (editor) 3rd dan TIA GB and Sensei Ludmilla Vinogravoda 2nd dan from the Russian Federation. ‘there is a question of what comes first. Is it form or power? Many will say that form comes first but we have found from teaching many children that they will learn at least three times faster if we begin with power’. S Sergei later demonstrated the methodology in the Dojo, … it made sense and his students of course are the proof of this method. ‘ from power good form is created, only later is more detail added. Editor's note; yes, I'm guilty there, perhaps I will look for more self learning in my own students in future. 'It takes time, your own time, to feel the Jo, not understand it but feel it. The Jo, and ken, need to become as much a part of your body as your own arm and you should be able to manipulate it as such'. Editor's note, perhaps only those in the right place on the path will see the wisdom in these words. 'Is form or essence more important? You know the game for children where they seek a treasure and one who knows will call out, 'cold, warm, hot.'? Our journey through life has these moments when we make some spiritual progress: we can't explain this to self but there is a sense that what we have experienced has taken us closer to what some might call God. For whatever that means to you, we wish to take one step on the path together'. Changes in self can make it appear that the kata changes, it does not. People say, 'but you have changed that bit'. However it is how you and they see it that has changed. Change occurs for what is necessary for the one on the path at the time. A good teacher is needed to give you opportunity to find ways you can change, the kata does not. Seek ideas on emphasis, direction, body posture, energy, where to relax and where to consolidate. Jo can add to body balance. When blocking with Jo try to release your own tensions .... breathing out on the block can lead to relaxation and be powerful'. Editor's note; I wanted to write an article for you the reader which would set out some achievable insights into the Jo practice. I watched Sensei Sargeant demonstrate different levels of understanding and speak of his discoveries. As I watched and listened the sense and truth was apparent, but I am unable to express it in words – it is simply a personal journey of discovery to be found in your own time and place ... and if you want to. A bit like a holiday snap of a beach or a tree, they mean little to anyone else ... other than those who have been there or plan to. At a certain level the practice of jo kata can almost seem like a more expressive version of counting prayer beads. So, as my porridge cools and the island of Kefalonia warms in the Sun, I conclude that the Jo in all its forms is merely a companion to you on your path, the path, which like the kata, remains the same – a spiritual path – a journey of the higher self with the rest of you joining in as required .... if not then perhaps the path and Jo have a different meaning for you.